IN Sariska, there have been no reassuring tiger pugmarks to indicate the presence of the majestic cats in the prestigious Project Tiger reserve since quite some time now. And a Sariska-type situation could be just waiting to happen elsewhere too. The last tiger sighting in Sariska was reported in November 2004 by a tourist, but there is no official confirmation. When the jungle fell silent to the roar of the tiger in March, a special investigating team of the CBI reported to the Prime Minister that there were no tigers left in Sariska, and that poaching was the main reason behind the disappearance of tigers from the reserve. While conservationists and media reports had sounded alarm bells much earlier, saying much the same, it was only after the Sariska report that findings of missing tigers started pouring in from elsewhere too — such as Ranthambore in Rajasthan and Panna in Madhya Pradesh. And, activists began pointing out the grave situation in several Project Tiger reserves in the country. Sariska today is national news. 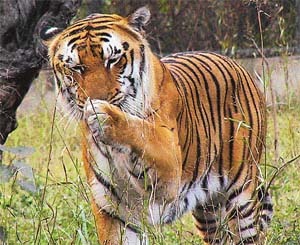 The possibility of tigers becoming extinct in the near future due to the high incidence of poaching made Prime Minister Manmohan Singh put Ranthambore on his priority agenda. Soon after the CBI report on March 17, he decided to constitute a task force on the status of tigers in wildlife parks, with CSE Director Sunita Narain as its chairperson. It is another story that Narain’s presence on the high-profile task force has irked several conservationists, who see her as an ." While the Prime Minister told the CBI to probe the case of the missing big cats from Sariska, he is reported to be following the case closely, including the activities of master poacher Sansar Chand, who alone is said to have poached over 100 tigers last year. The Ministry of Environment and Forests has sounded a red alert to all reserves, like it does every year. After studying tigers as a non-scientist for 30 years, all I can say is I have failed. Will the government be able to admit the same? Tiger trade is well-financed and coordinated between poachers, couriers and dealers. It is continuing as a result of lack of effective enforcement. With a tiger habitat spread over 300 million hectares the methodology of searching for pugmarks results in double counting and, at times, fudging of figures. The tiger is on an assured path of survival. Project Tiger is the most successful recent conservation strategy as it has saved habitats of other species as well. Those arrested for wildlife crimes should be tried and convicted speedily. Special courts are needed for this purpose. Locals should be involved in protecting wildlife. Poaching cases are fought in remote, district-level courts, where they are treated like any other crime, such as pickpocketing and minor theft. The exclusion of communities in the management of forest and wildlife resources affects gathering of information critical to prevent poaching. Missing tigers have generated public awareness of need for wildlife conservation. MPs of rival political parties have come together to take up the issue and a forum — the Tiger And Wilderness Watch — has been formed to save the big cats in particular and promote the cause of forests and wildlife. With tigers getting support from the likes of Rahul Gandhi, Renuka Chowdhury, B.J. Panda, Suresh Prabhu, Rajiv Pratap Rudy, Jyotiraditya Scindia, Anand Sharma and Manvendra Singh, besides Karan Singh and Natwar Singh, reports started circulating that the group was opposed to the Scheduled Tribes Bill that would enhance the rights of tribals, but would affect the health of forests. Though members of the forum denied opposing the Bill, the fact that it did not come up for discussion in Parliament is worrying tribal leaders, who say that the UPA government is bound by the CMP to restore the rights of forest dwellers. Others, like the Senior Advisor, Wildlife Trust of India, Ashok Kumar, believe that the Bill needs redrafting. Tiger habitat deterioration is the long-term result of illegal encroachments and diversion of forest land. And, with skin and bone trade spelling big money in the international market, saving tiger habitats is important, he says. Environmental lawyer Sudhir Misra echoes his views and is clear that tribals do not need such rights. "By doing so you will be only forcing them to go inside the forests. Instead, give them education and empowerment," he says. The pro-tribal lobby, in contrast, says tribals are friends of the wildlife and cannot harm tigers. That India plays an important role in the trade of wild animals was not generally known till even 10 years ago, says Ashok Kumar. While India is one of the earliest members of the Convention on International Trade in Endangered Species of Wild Fauna and Flora (CITES) and has strong conservation ethics, in domestic and international policy, the fact is despite all these laws and policies, illegal trade continues to flourish, he adds. In August 1993, when a consignment of six full-grown tiger skins, besides tiger bones, and leopard, chital, fox and otter skins were seized from Majnu ka Tila in Delhi, the extent of this heinous crime was established. Since then several seizures have been made. Smugglers get shahtoosh wool from Tibet to India and take tiger skins and body parts back to Tibet and China, says Ashok Kumar. While India is the hub for the supply of dead tigers, China is the biggest retail market from where the tiger skins and parts are further supplied to Vietnam, Taiwan, West Asia, South Korea and Japan. It is believed that in the past 10 years 1,500 tigers have been killed and Rs 900 crore earned by poachers. 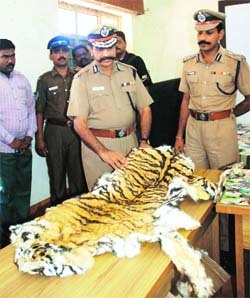 A tiger skin is worth Rs 10 to 12 lakh and the value of each poached tiger is Rs 60 lakh. A government-commissioned independent agency, set up recently to compile and analyse the country-level tiger poaching data over five years (1999-2003), recorded 411 cases — of which 173 relate to mortality and 238 to seizures. Out of the 173 mortality cases, 114 tiger deaths were due to poaching, the government admitted in an affidavit submitted to the Supreme Court recently. Trade routes are well-established and all fingers point at Tibet and China. The trade routes are well established, says Ashok Kumar. Skins are collected from all over India in Sadar Bazar in Old Delhi and from there they are dispatched through Nepal and more recently, Leh. There are special codes for all items. A tiger skin could be coded chaddar or kambal. "The trade is well-financed and coordinated between poachers, couriers and dealers and this cruel trade is continuing as a result of lack of coordinated and effective enforcement," he says. The increased economic influence in Tibet and China is also spurring the trade. Investigations have tracked tiger furs in markets of Tibet, where it is used as traditional clothing. In October 2003, skins of 32 tigers, 579 leopards and 665 otters were seized en route to Lhasa in Tibet, highlighting the enormity of this illegal trade. On April 6, when a large consignment of animal skins was seized by the Delhi police, most of these had a rubber stamp on the back, saying "OK Tested, W-7", and had signatures in Tibetan. While signatures in Tibetan have been seen in many seizures of animal skins in the past, this was the first time that there was a quality-approval stamp too, indicating that the crime is only getting more organised. Ashok Kumar, who filed a petition in this regard, says this has added a new dimension to the well-established trade of tiger and leopard skins. The case came up for hearing in the Supreme Court on May 12. "The members of the three-Judge Bench were horrified after they saw a photograph of the quality-control stamp on a leopard skin, but they were also amused that those dealing in this illegal trade were also demanding quality control now." From a peak population of 4,334 tigers in the wild in 1989, it is now estimated to have dropped to 3,500. In Project Tiger reserves, which harbour 50 per cent of the tiger population, the figure is put at 1,600. In the CBI report on Sariska tiger reserve between 1995 and 2003, there were 24-28 tigers. In 2004, the number of tigers was between 16 and 18. Since September 2004, no tiger has been sighted. It is now extinct. Since 1995, the number of tigers killed is estimated to be 1,500 and the poachers have earned over Rs 900 crore by selling tiger skin and other parts in the past 10 years. Despite talks of setting up a National Wildlife Prevention and Control Bureau, on the lines of the CBI, to gather intelligence and stop poaching and illegal trade of wildlife in the country, the government has not yet been able to put in place an organisation that can control this trade. Clearly, while existing enforcement agencies are not tackling the issue properly, the district-level courts — where such cases are taken up —are also not taking wildlife crime seriously. Till the infamous Salman Khan black buck case happened in 1998, there was hardly any focus or media attention on wildlife crime, says Misra. There is, however, still not enough sensitisation of the judiciary at the district level. "Cases concerning wildlife and poaching are fought in remote district-level courts, where they are treated like any other crime, such as pickpocketing or minor theft," he adds. It is not surprising, therefore, that master poacher Sansar Chand has managed to evade going behind bars till now. But Misra pooh-poohs the idea that foresters could be involved with poachers in this heinous crime. "Poachers do not need the support of forest guards. How do you expect foresters and guards, at times armed with just lathis, to fight poachers who have sophisticated weapons and devices. And to top it all, the conviction rate is so poor that most poachers go scot-free. While Indian wildlife laws are very powerful, they need to be enforced properly along with legal empowerment of field staff and sensitisation of the local judiciary," he adds. Member of the Prime Minsiter’s Tiger Task Force Samar Singh agrees that those arrested in wildlife crimes should be tried and convicted speedily. "Wild life crimes need special courts. He suggests that people living in jungles should be involved to protect wildlife. Otherwise, he says, the problem can never be solved. Voicing similar views, Narain says, "This has exacerbated destitution and made them apathetic towards forest protection. Experts say that in spite of organised investigations and professional law enforcement, Veerappan had the run of the land for many years as he had the support of local communities which had been denied access to the benefits of forests. The same is the case with tiger conservation. The exclusion of communities in the management of forest and wildlife resources affects gathering of information critical to prevent poaching." Narain recommends setting up of a leaner, meaner wildlife-crime organisation, comprising young volunteers to track crime, manage databases and follow thorough investigation on the pattern of the narcotics bureau. "Experts have recommended setting up of a multi-agency unit, staffed with 285 persons and with a budget of Rs 163 crore spread over five years," she adds. "To save the tiger, the country needs a brand new approach. The existing methodology of tiger management by excluding the involvement of local people from tiger habitats is faulty. It can never work in a country where the livelihood of local people is dependent on forests. We need a conservation strategy that involves forest people so that they, in turn, become protectors of tigers." She hopes the task force will be able to submit its report in three month’s time, but adds that the members do not have a magic wand or quick-fix solutions to the problem. Tiger conservation is dependent on a census method which is far from reliable, says H.S. Panwar, a member of the task force. "The methodology of searching for pugmarks is doubtful for the simple reason that our tiger habitat extends over 300 million hectares. This also results in double counting and at times fudging of figures." A consensus seems to be emerging on the methdology that includes habitat appraisal by mapping tiger habitats, measurement of prey bases besides improving the traditional pug mark method using camera traps and digital methdology. Belinda Wright, Chief, Wildlife Protection Society of India , who is at present in Ramthambore in connection with a state-level visit, also stresses on a more transparent management of forests. "What happened in Sariska can also happen elsewhere," she says with a note of concern. After all, about 100 years ago, there were 100,000 tigers worldwide. Today, there are less than 5,000 wild tigers. Project Tiger once saved the tiger from extinction. Rajesh Gopal, Director, Project Tiger, admits there are problems but is optimistic. He rates Project Tiger as the most remarkable process. "This has put the tiger on an assured path of survival. Despite difficulties, I would consider it as the most successful conservation strategy in the contemporary scenario as it has saved habitats of other species as well. While the Centre provides a set of directives and fundings, the responsibility of implementation lies totally with the states. Forests and wildlife are traditionally managed by the states. The states have to struggle with their own set of complexities: several forest guards are above 45 years and unable to do their duty; land use has led to man-animal conflict in certain areas; and some reserves have the presence of Naxalites. Till November 2004, tiger sightings were reported in the habitat, says Rajesh Gopal. The Sariska failure can be blamed on the long drawn out man-animal conflict. There are 28 villages inside the forest. All this led to disturbances in the habitat due to which the tigers did not breed at all. To top it, administratively, Sariska has been slipping in the past seven-eight months because of lack of supervisory control. There was a total systematic failure. The 2001 census pegged the figure at more than 3,600 in our 28 tiger reserves. Rajesh Gopal asserts, "I think there are more than 3,500 tigers even now. The actual figure will only be known after Project Tiger census begins in November." The Wildlife Institute of India will give its ecological report after which the feasibility of reintroducing tigers will be explored, he adds. Tiger Task Force, he is hopeful, will be able to suggest ways and means to improve the present system because the members are well-known and established conservators. And the 300-odd NGOs, he admits, need to play a more positive and complimentary role. Is there any ray of hope? The Madhya Pradesh Chief Minister has been quoted as saying that his tigers are safe and that nobody could take his parks away from him. What kind of statement is this? Poaching is an accepted serious problem, why has a manhunt not been launched for poachers on the wanted list. For 20 years, there have been no recruitments and the average age of a forest guard is 50 to 55 years. The CBI found 75 per cent of the Sariska staff unfit. At least, I cannot see any ray of hope for now. After studying tigers as a non-scientist for 30 years, all I can say is I have failed. Will the government be able to admit the same? If you want to save tigers, give them inviolate space. Tiger turf for tiger to live has to be protected and this is a fact of science. Engage local people to protect wildlife and not exploit it. Whenever man has come in to use land, tigers have become extinct from that area. It is not possible for man and tiger to live together. How can you manage that in this country? It all depends on how many tigers the Prime Minister wants to save, 500, 1000, 1,500. Tigers cannot be saved if they do not have inviolate space. Let him take the tough decision and decide how much land can be set aside for them, without the menace of tourists and jeeps playing havoc with their lives. More than 35 to 40 per cent of the world’s tiger population lives in India. A tigress with cubs needs to live in totally protected areas. If you cannot give them space, tigers will not have any future and there is no need to waste time on debating how to save them. What about the tribal Bill? The Bill needs to be re-drafted and debated to provide rights to tribals in tandem with wildlife. Ideally, the Bill should have been called ‘Forest, wildlife and tribal rights Bill,’ having three parts which deal with protecting the rights of wildlife, forests and tribals. In the present form, the Bill will only increase conflict and tribals will be seen by others living on the forest land. As per the proposed Bill, each nuclear tribal family will get 2.5 hectares. Estimatedly, there are 80 million tribals in the country. If there are 15-20 million nuclear families and each one gets 2.5 hectares, you need 50 million hectares. And there are only 68 million hectares of forest land. Going by at least 2 per cent growth rate of population, the demand will only increase.